Holy sweet fantastic, this is gorgeous. I already liked Augie March a lot before hearing this set; they managed to wow a midday tent-full of jaded music executives at the Boulder Records & Radio conference last August, coming all the way from Australia to play their hearts out with passion and earnestness. My brother, who is generally much cooler than I, tells me that in the land down under they are megastars, and I think their album Moo, You Bloody Choir is excellent. They are starting to get some well-deserved notice here. Already literate and lavish, their songs become absolutely something else in this setting. “One Crowded Hour” makes me want to climb inside of it even more than before. What an elegant, evocative, soaring song. 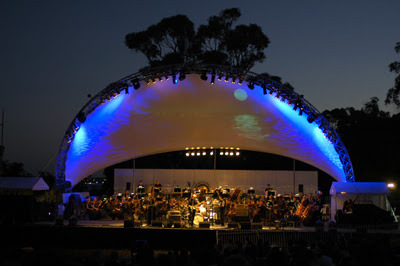 Tagged with augie march, try it with an orchestra. One crowded hour almost made me cry!! Great song, never heard of this band and once again Fuel/Friends provides me with music ivÂ´e never stumbled upon before. Great Job!!! They sure are! We love them! Thanks. As always, I’ve heard something new, or heard it in a different way. I think calling this awesome wouldn’t be doing it justice. Thanks for introducing me to something new. Oh, i posted a playlist over at my blog i think you might like, it’s a fun indie/brit pop playlist. I got kinda lost in a mountain of music tryign to put it together, so the whole process took a few hours more then i had planned lol, it makes for an easy listen tho. EscapeTribe.com if you fancy giving it a listen. hey, that’s a great find, I missed this when it was broadcast. I have a certain level of pride when an Australian band starts getting press overseas, particularly one as unique as Augie March. Glad you are enjoying the music, if you are after other stuff from Australia give me a shout. Btw I hope you don’t mind I put a link to your post on my own blog. All 3 of their albums are great but i especially like their first “Sunset Studies”. Definitely worth a look. Thanks for another great check-out! Augie March are awesome…track down ‘There’s No Such Place’ as well – my fave Augie song. They’re pretty big down here, it’s true, and supporting Crowded House is a pretty good endorsement! Thanks for the shout out for an Aussie band! In the land down under they’re amazingly loved. One Crowded Hour is such a beautiful song.. And with the orchestra behind them they’re even more amazing if that’s possible. Amazing musicians… And down to earth ppl to boot. Could you possibly re-up this? I’m a huge Augie March fan, and would love to hear this!